A new Collaborative Approach for eNhanced Denoising under Low-light Excitation (CANDLE) is introduced for the processing of 3D laser scanning multiphoton microscopy images. 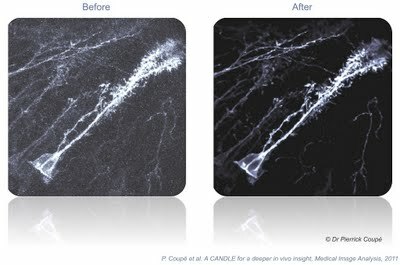 CANDLE is designed to be robust for low signal-to-noise ratio (SNR) conditions typically encountered when imaging deep in scattering biological specimens. Based on an optimized non-local means filter involving the comparison of filtered patches, CANDLE locally adapts the amount of smoothing in order to deal with the noise inhomogeneity inherent to laser scanning fluorescence microscopy images. An extensive validation on synthetic data, images acquired on microspheres and in vivo images is presented. These experiments show that the CANDLE filter obtained competitive results compared to a state-of-the-art method and a locally adaptive optimized nonlocal means filter, especially under low SNR conditions (PSNR<8dB). Finally, the deeper imaging capabilities enabled by the proposed filter are demonstrated on deep tissue in vivo images of neurons and fine axonal processes in the Xenopus tadpole brain. P. Coupé, M. Munz, J. V. Manjon, E. Ruthazer, D. L. Collins. A CANDLE for a deeper in-vivo insight, accepted in Medical Image Analysis, 2012.